Dr. Neeshat Khan and her staff offer care to their patients who are need of orthodontics and other types of dental care. The office of Neeshat Khan, DDS serves patients in the San Jose, California area, as well as those who live in the surrounding communities. When Should a Night Guard be Used? Night guards can be used for many different reasons. Individuals who grind their teeth while they sleep will benefit from the use of a night guard because it protects the surface edges of the teeth from being ground down or broken off. Night guards can also be used for patients who have sleep apnea or other health conditions that prevent them from sleeping comfortably. A night guard constructed from hard plastic resins or from rubbery, gel-like materials that are molded to the shape of the patient's teeth. A hard resin night guard will snap on to the teeth and be held firmly in place, while the softer night guards are normally held in the mouth by the pressure of the jaws clenching. The Invisalign® system is just one of several types of clear braces that are used to straighten and re-align the teeth. Invisalign® trays are designed to snap onto the teeth and make minimal adjustments over the span of approximately two weeks. The program involves the use of up to 24 specially designed trays that are used consecutively to create a series of changes in the structure of the mouth. The trays are easily removed and can be taken out during meals or if a person needs to appear without them for a meeting or social occasion. The trays must be worn for a specific number of hours each day to be effective. In addition to traditional braces that use the metal bands and brackets, new technology has provided orthodontist with several other options. Composite braces use ceramic brackets that are bonded directly to the surface of each tooth. Clear braces and retainers can also be used. 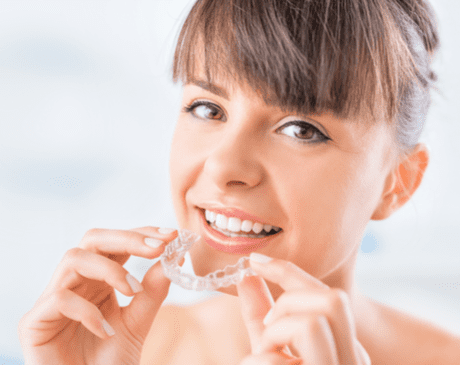 The Invisalign ® system uses clear trays that are easily snapped on to the edge of the teeth allowing for gradual changes to be made to the alignment of the patient's bite pattern. The dentist can assess the patient's alignment issues and make recommendations as to which type of braces or orthodontic appliances would best suit their needs.